Well, I haven't posted one of these for a while, but when you see the distinctive almost hip-hop street art styles of artist John Jennings, you'll definitely see why I chose him as the artist to get the Making A Mark ball rolling again. Not only does his work have a street level feel, he specialises in the street appeal of Marvel's more 'Marvel Knight' type characters. Isn't that so Doc? You know what? 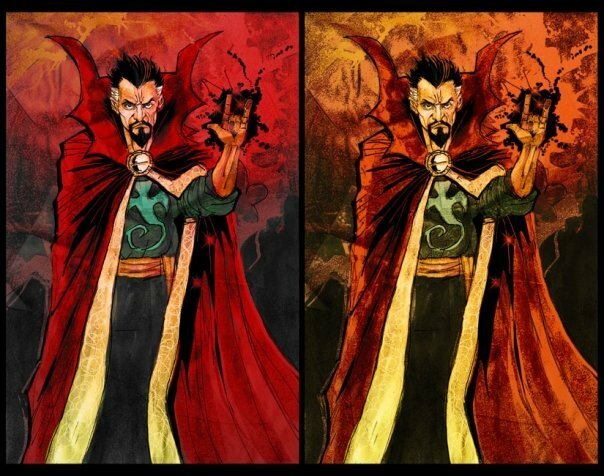 Out of every comic character you can think of, it's Doctor Strange's classic garb I go nuts over every time it gets changed for whatever reason. 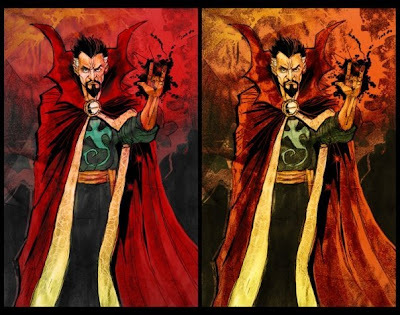 I think it's probably one of comics most unsung and coolest, and as John shows, in the right hands still makes Stephen look like the Sorcerer Supreme. 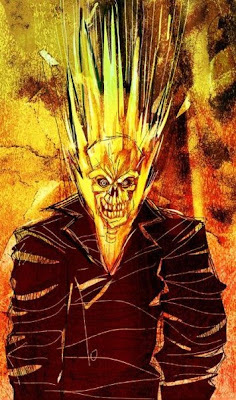 Hey, if you're talking 'Marvel Knights', Ghost Rider has to be in there somewhere too doesn't he? While the more mohawk styled flame seems part of John's own take, somehow this blazing image reminds me of Chris Bachalo's cyber-punk take on Ghost Rider 2099. Still stylised this strongly, there's no reason why that title couldn't make a comeback right? No one - and I mean no one, shoots up the golden jacket and gets away with it. What do you think? Sound off below in the comments section or click here for more great Making A Markists. To see more of Jennings' hot pencils, visit his gallery after the jump! Not much to say other than damn cool art by this Jennings fellow. 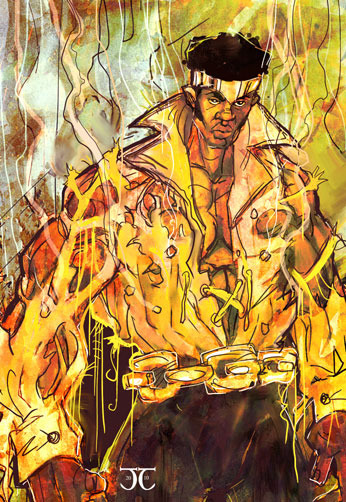 The Dr.Strange piece is my favorite, but he does make Luke Cage look damn good, and yeah, his Ghost Rider really does smack of cyberpunk huh? You seriously have to get a commission/percentage of their next big check Dan, for the free publicity you guys these talented people. A cheque - heck people don't have to be artists to send me one of those Dale, I'll collect anyones signature on that canvas! Okay, this will probably be blasphemy, but I prefer the new Luke Cage look over the classic, about 100%. Ususaly I'm one to stick with the original and complain on changes on what works well, but really, that look... Not well. Blasphemy from you Aliera, no such thing! I often state I like a costume then the comments section tells me I'm one hand clapping on that front, so you won't be alone there no matter which way the vote goes. Me, I like all Luke Cage's suits over the years. The yellow one is a classic, he even joined the FF in it, but would I have him wear it again - computer says 'No'.